From hiring to payroll, human resources departments have a lot to manage, and the volume of data they track and report is always growing. That’s why HR teams need the right process to understand and reach their goals. Without key performance indicators (KPIs), “success” is a vague target that is nearly impossible to achieve. Goals and metrics need to be more intentional – and that’s where HR dashboards come into the picture. Behind every successful HR department, there is a clear data strategy that involves setting strategic goals, identifying the right KPIs, visualizing data, and making informed decisions. Think about the main objectives of the company as a whole. Where does HR fit into the equation? Your answer to that question is a good starting point when determining the goals of your department. In order for a company to succeed, all parts of the business need to move in sync to reach the same targeted outcome. Regardless of what goals you are pursuing, they need to be measured and quantifiable so you can use data to track your progress and performance. You also need to communicate your goals to all members of the human resources team to make sure everyone is on the same page and working toward achieving them. Key performance indicators measure how successful your HR department is at accomplishing a goal or objective. They are quantifiable performance measurements that help you understand whether the department is on track or not because they are tailored to your specific goals and objectives. Another data-oriented term that you may be familiar with is analytics, which is sometimes used interchangeably with KPIs. There is an important distinction, however. Analytics answer specific business questions questions while KPIs track your progress toward goals. Analytics – especially predictive analytics – is future-focused, while KPIs focus more on extant data from the present or past. It is important to measure both analytics and KPIs to get a holistic view, but dashboards are best suited towards measuring KPIs because they show data in real-time. The KPIs that your HR department measures may be different from others because it all depends on your goals. For example, if your primary goal is to increase retention, you would want to measure employee satisfaction, voluntary turnover rate, and retention rates per manager. A different HR department may be focused on employee absenteeism and measuring absence rate, employee productivity, and overtime expense. Although they are quite different, both departments are focusing on the right KPIs. Sometimes, it can be difficult to know what exactly you should be measuring, even when you have a clear goal in mind. The S.M.A.R.T. framework can be used to double-check your KPIs and make sure they are effective. If your KPI does not follow this framework exactly, you may need to re-strategize. After setting departmental goals and identifying the right KPIs, the worst thing that you could do is not prioritize collecting and analyzing the necessary data. This is easier said than done, as HR professionals already wear so many hats and may not want to add “data scientist” into the mix. That’s why the most important part of creating a data-driven HR strategy is figuring out the best way for you to gather and manage information. You can significantly decrease the time it takes to compare metrics by compiling them into one place with an intuitive, visually-appealing format. 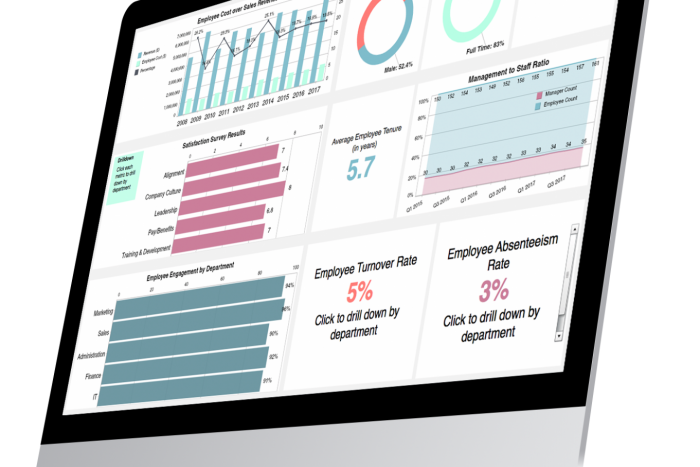 HR dashboards can combine multiple data sources and communicate information to the whole company. You can even make company announcements, like introducing new employees or initiatives, through wall display dashboards. When designed correctly, dashboards provide an extraordinary level of accessibility and efficiency. This greatly improves the decision-making process, by providing you with the right data to make an informed decision. When the right KPIs are closely monitored, you can ensure that benchmarks are being met and you are successfully aiding in you company’s larger initiatives. Workforce data is more available than ever, so now is the time to put it to good use. Jenna Ryberg is the Human Resource and Accounting Director at iDashboards, a data visualization software company on a mission to improve reporting. She has been with iDashboards since 2009 and has developed and maintained the Human Resource and Accounting departments, policies and procedures over this period. Jenna has an Associate’s degree from Oakland Community College in Business Management and has been a member of SHRM since 2014. On a personal note, Jenna is a mother of 2 boys that play travel hockey and is an active runner in her free time.